The Rock Tools Attachments’ sieving bucket is a digging and screening bucket in one attachment, saving you money and time. Materials sift faster allowing finer product to sieve, while larger rocks and rubble remain. The sieve can be adjusted with various screen sizes to produce graded material. Our sieving bucket is the powered attachment to meet all the needs of a traditional skeleton bucket, but with the distinct advantage of reduced wear on your excavator’s pins and bushings and is easier on operators. The comparatively gentle sorting process preserves the integrity of the oversized material, reducing contaminates in the screened material. Our sieve buckets fit skid steer loaders and excavators from 8 to 35 tons. Click on the model number below for more details or get in touch. Anything can go into the sieving bucket; even hard and abrasive materials like concrete or rebar won’t interfere with the sieving bucket’s screening process. The Rock Tools Attachments sieving bucket’s curved shape allows for easier filling and operating over other box shaped screening buckets. The sieving bucket comes standard with 4” square screens, which can be reduced with our easily attached fine screening elements. Screening elements are available for as small as ½” minus and can be customized to suit your needs up to 4”. Our full line of sieving buckets gives us the versatility to provide the right product to fit your application and equipment, optimizing productivity for your application. Why choose our sieving buckets? The Rock Tools’ sieving bucket is a digging and screening bucket in one attachment! It allows for on-site sorting and recycling of material without the need for costly transport and off-site processing fees. Using your existing capital equipment, easily separate oversized material from useful backfill and fines allowing for immediate recycling and a marked reduction in material handling time and landfill fees. Unlike many other screening buckets, the Rock Tools Attachments sieving buckets use interchangeable screening elements to shake the material within the bucket. This process minimizes wear to the screening elements and eliminates the risk of oversized material jamming encountered in rotary style screeners. The necessity of efficient and environmentally friendly jobsites is on the rise, let us help you keep costs down, keep productivity high, whilst being environment friendly. Learn more about choosing the right sieving bucket for your project. Does your project also need a jaw crusher bucket? 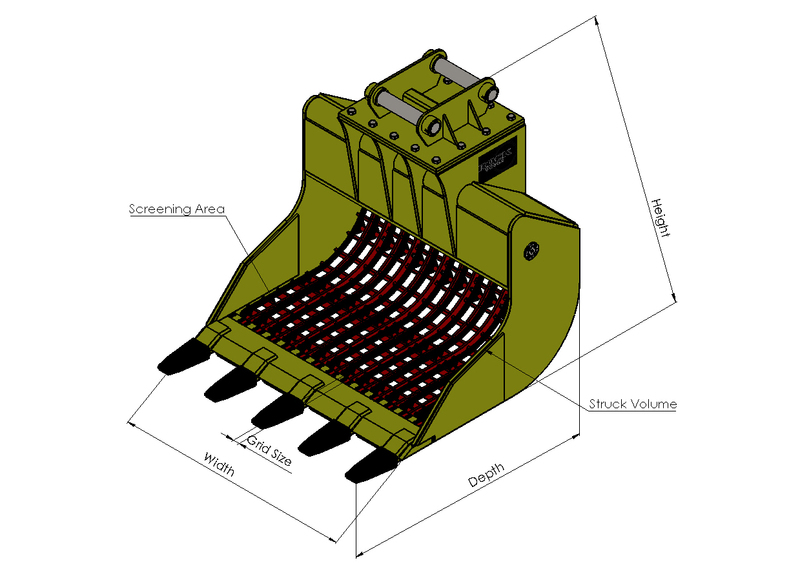 We also supply screening buckets and rotary crusher buckets.